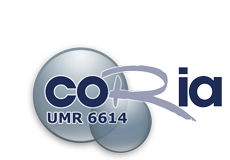 CORIA is a Joint Research Unit (UMR) attached to the Institute of Engineering and Systems (INSIS) of the CNRS, the University of Rouen and the Institute of Applied Sciences (INSA) of Rouen. It is located on the Madrillet Technopole, near Rouen, in Normandie. The CORIA research fields cover fundamental and applied studies dedicated to reactive or non-reactive flows: multiphase flows, turbulent mixing phenomena, combustion, plasmas, etc. Physical mechanisms and processes leading to the reduction of pollutant production in reactive systems are also included within the main research activities.